1Before Christ – Lost, hopeless, and living independent of God. 2Unbelievers – will be judged and separated from God for eternity. 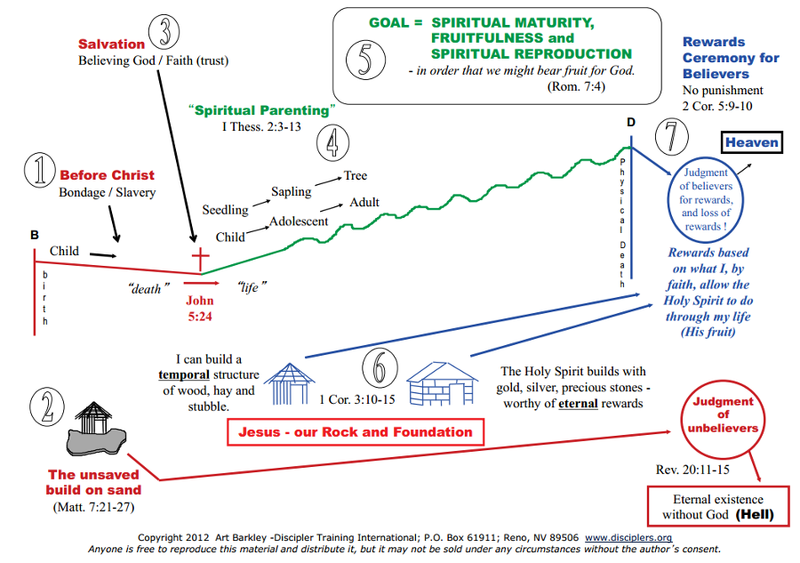 4Discipleship – the beginning phase of a new life with God. 5Goal - God wants to mold you into a mature Christian. 7Rewards Ceremony – Commonly called the Judgment Seat of Christ, at which time each believer will individually appear before Jesus Christ to be rewarded for what he/she has allowed the Holy Spirit to do through their life while living here on earth. There should be no fear of punishment at this event, although the disciple needs to be aware of the potential for loss of eternal rewards, since all that is wood, hay and stubble will be turned into worthless ashes. It is important to note that no unbeliever will be present at this event. Your New Life – The event of salvation is the entrance into a new life with God, prepared by Him to completely meet your every need, as you fit into His design. Now as a Christian, you will want to fit into God’s plan for your time here on earth, which is but a small part of His eternal plan for you. The Bible says that you are as a spiritual baby, needing a spiritual parent who will help you to understand the basic spiritual concepts of your new relationship with God. As you begin attending church services, and hopefully join a Bible study group, ask the Lord to lead you to someone who is willing to spend regular individual time with you for at least the next three months or so to help you in your new spiritual walk with the Lord. If you cannot find another believer to personally mentor you, please feel free to contact us as we may be able to put you into contact with someone who is available.